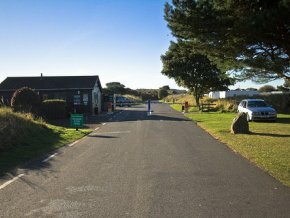 We have just had the pleasure of staying at the excellent Yellowcraig Caravan Club site which is situated on the edge of the small but beautiful village of Dirleton. Dirleton is approximately 20 miles east of Edinburgh on the A198 and a couple of miles west of North Berwick. Although only a village, it boasts its own castle (or medieval fortress) which dates back to the 13th century. The area is just packed full of history. The entrance to Yellowcraig CC. 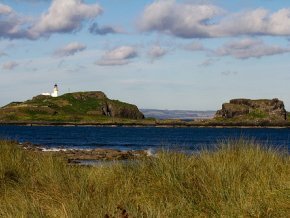 The Yellowcraig site itself is only five minutes from the beach and has excellent views of the small coastline islands of Fidra, Ibris and Lamb. On site there is a mixture of grass and hard standing pitches that surround the wash block and are split into a number of areas. The wardens are friendly and helpful and make the atmosphere welcoming. This site was recommended to us and we were not disappointed as it is one of the nicest sites we’ve stayed on. We stayed from 24th October until 28th October 2010 and hit lucky with the weather. With the exception of high winds one night, it was good. We arrived on the Sunday and we were given a large choice of pitches to choose from. I estimated the site to be 75% full. This was I think, due to it being the Scottish school half term. 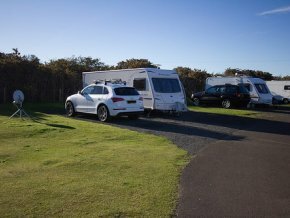 We found a hard standing pitch that was up to the usual Caravan Club standard, having plenty of room to accommodate our caravan with awning and our car. Our hard standing pitch had plenty of room for our car and caravan. On the Monday the weather was glorious with clear blue skies and above average temperatures. 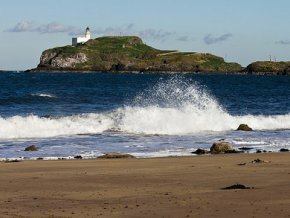 We decided to venture out to the beach which is one of the best I have seen for both cleanliness and views, which included views of the islands mentioned above, as well as Bass Rock further along the coast at North Berwick. As you can see from the photos this is a beautiful area to visit. We returned to the caravan for a spot of lunch before venturing out again this time to the village of Dirleton. We then did a couple more geocaches before returning to settle in for the night. The next day (Tuesday) was overcast but no rain. We drove into Edinburgh which is a little over 20 miles away. It takes between 30 and 45 minutes to get into the centre of Edinburgh and parking was plentiful but expensive. Our day can be summarised by; a look around the shops, a visit to the castle (£33 for two adults and a child) and an open air bus tour (£28 for two adults and a child). Both of these I felt were very expensive for what they were, especially the castle. This was however, a ‘once in a lifetime’ trip which is how I justified the cost. I wouldn’t however, go again. The open air bus trip although pricey, was a little more value for money in that it took you around the main visitor attractions of Edinburgh and you could use it when you wanted throughout a 24 hour period. The fantastic views and clean beach were accompanied by warm weather. All in all, it was a very enjoyable day. That night we experienced very high winds which meant a few more awning pegs were needed to batten down the hatches (at 4.15am) but nothing too serious, apart from the lack of sleep. The wind continued throughout the day (Wednesday) but the skies were blue and most importantly, no rain came. We took the short drive to North Berwick and did a bit more geocaching. We walked around the shops and then had the mandatory seaside fish and chips which were fattening but delicious. The North Berwick Law is a former volcanic hill which overlooks the town and stands at 613ft above sea level. We did intend to climb the Law but, due to the high winds we decided against it for safety reasons (although it would have been a good way to walk off the calories from the fish and chips). This area is also apparently good for golf and there are a number of courses to hand. Bass Rock is a volcanic rock island though we couldn’t reach it due to high winds and rough seas. 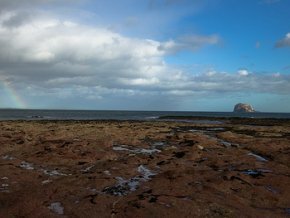 Off the coast, looking out from North Berwick is the island of Bass Rock. This is another volcanic rock island which is home to a large colony of Gannets. There are regular boat trips to the island although there weren’t any when we were there due to the rough sea and high winds (I presume). North Berwick also has a seabird centre. We didn’t go on this occasion, although it does appear to be very popular. We thoroughly enjoyed our visit to the East Lothian area of Scotland and the Forth of Firth. There is certainly a lot to see and do here. Yellowcraig Caravan Club site is definitely one that we intend returning to. It has good facilities, a nice clean shower block and excellent showers. All in all, we had an excellent few days away. * Geocaching is an outdoor sporting activity in which the participants use a Global Positioning System (GPS) receiver, mobile device or other navigational techniques to hide and seek containers called ‘geocaches’ or ‘caches’. A typical cache is a small waterproof container containing a logbook where the geocacher enters the date they found it and signs it with their established code name. Larger containers such as plastic storage containers can also contain small items for trading. Header banner image credit to Kim Traynor [CC BY-SA 3.0 (https://creativecommons.org/licenses/by-sa/3.0)], from Wikimedia Commons.